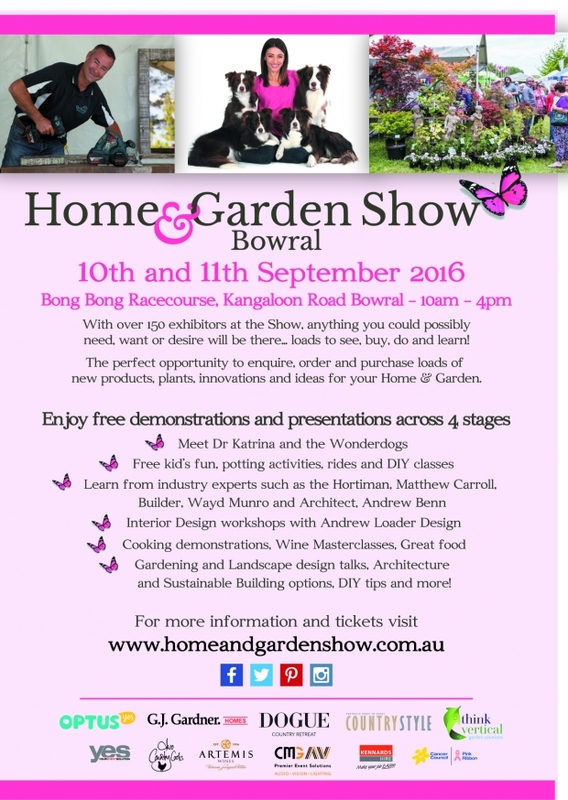 The Home & Garden Show is a showcase of everything Home and Garden! With over 150 exhibitors there will be everything you could ever want to see, do or learn! A full schedule of presentations and demonstrations are planned throughout the two days - all included in your entry price. Plus, by securing your tickets online, you also reserve your complimentary 'Sample Bag' which includes the latest edition of Country Style magazine, $35 voucher from Hello Fresh plus loads more! These are limited so you will be sure not to miss out. Find out about the latest products, new trends and learn how you can create the home and garden of your dreams! Plus loads of activities for the kids! Leashed dogs are also welcome! Proudly sponsored by Country Style Magazine, G J Gardner Homes, Optus, Think Vertical Gardening Solutions, Dogue Country Retreat, Two Country Cooks, Artemis Wines, CMG AV, Kennards Hire and Yes Events.